Being a mom is awesome. My kids may drive me insane but they makes my life fun and interesting. If you are looking for the perfect gift to give to your mother, I have a few suggestions. I am obsessed with the I love Pink Marshmallow collection. The scent is addictive. I love the sweet candy scent that is making my mouth water. It contains strawberries, raspberries, black currants, and cranberries extract that is giving that sweet berries scent. I could sniff my arms all day and not get tired of it. The bubble bath and shower gel made my bathroom smell amazing. My favourite is the body butter. It hydrates my hands and body while leaving the addictive sweet candy scent. The Spritzer comes in a cute little bottle that you can carry it around for anytime you want/need the extra boost. If your mom is a beauty junkie then she might like some brushes. You can never have too many brushes. Real Techniques creates amazing brushes you have to try if you haven't yet. I usually apply my makeup at work so I always have a second set of brushes to keep at my desk. I like the Real Techniques travel essentials set that comes with everything I need on the go. 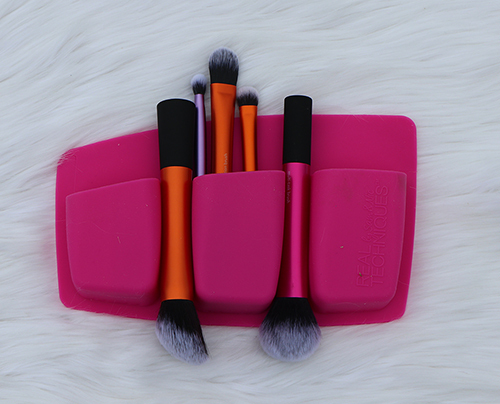 It contains the foundation brush, shadow brush, and a multitask brush in a carrying pouch that turns into a drying stand. 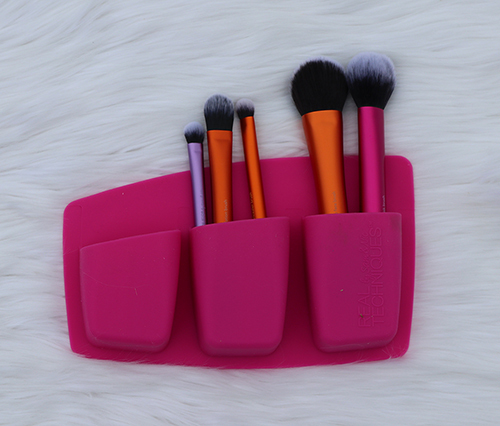 The drying stand is a must since you don't want to damage your brushes. Brushes needs to be facing down when drying so the gravity will pull the water away from the brush handle while not wearing out the glue. You don't want the brushes to stand on its head because that will damage the brushes too. The stand has elastics to hold on to the brushes when they are drying upside down. The technique essentials set comes with three brushes, but the pouch allows you to add two more brushes. You might like the include the Real Techniques instapop face brush. The brush head is on a slight angle. 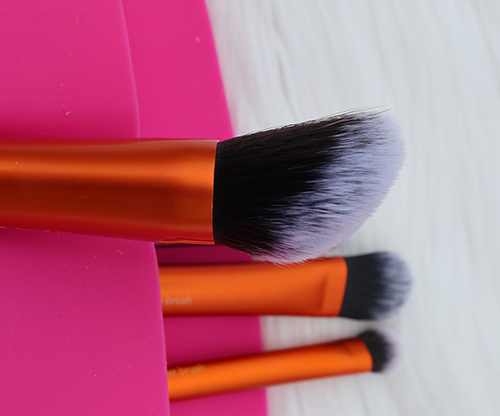 I love that the brush head is huge and allows me to cover my whole face faster and easier. Your mom might also like the Real Techniques expert concealer brush. This brush helps to cover all those black circles developed over the years staying up late taking care of the kids. I love every brush I used from Real Techniques are soft and gentle on my face. I am super excited to try the Real Techniques miracle cling 3 pocket organizer. It is a must have for every mothers. It is a rubber organizer that can stick to any flat shiny surface like a mirror or glass. It can hold up to 20 lb of brushes but I don't think I have that many brushes that will weight 20 lbs. 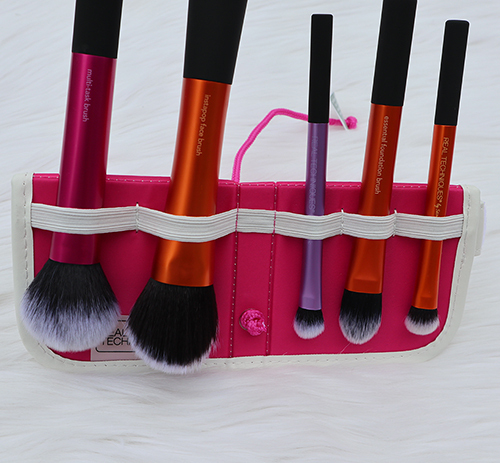 Each pocket can hold 3-4 brushes, depending on the size of the brushes, of course. It does not have to hold only brushes. It can hold my eye pencils and mascara too! The best thing about Real Techniques products is their products are high quality without breaking my wallet. This giveaway will run from May 13th to June 10th, 2018 (midnight EST). Winner, You have 72 hours to reply. You must be 18+ Canadians Only. Good Luck! Psst - Can't win if you don't answer the mandatory question. I am not responsible for shipping and handling or damages of the prize. The prize is shipped by the Sponsor and they may substitute the prize depending what is in stock. I'm from Ontario. I'd like the Deep Cleansing Gel for Brushes. I'm from Ontario and I would love to try the Real techniques brush starter kit. I’m in British Columbia and any real techniques brushes would be amazing they all look so good. I am fromSk and would love to try the Real techniques Brow Kit. Real Techniques Expert Face Brush would be great for blending my foundation.I am from Ontario. NS and I’d love to try the brow kit. I'd like to try the retractable kabuchi brush. Alberta. EcoTool Bamboo Bath Brush. Can't wait to try the "I Love Marshmallow" Bubble Bath & Shower Gel! Would love to try the "Real Techniques Instapop face Brush"
I'm from Nova Scotia and I would like to try the Real Techniques Eye Detail + Define set. Ontario! I would love to get the Johnny's Chop Shop Born Lucky 2in1 Shampoo for my hubby to try.. I like the EcoTools Pure Complexion Facial Sponge for Sensitive Skin. I'm from PEI, and I'd love the Real Techniques Color Correcting Set...I love so many of their brushes already! From Manitoba. I'd like to try the deep cleansing gel for brushes. Alberta and I would love to have the Real Techniques Instapop face Brush"
I'm in Ontario and I'd love to try the expert concealer brush! I would like to try the Real Techniques Foundation Brush. I'm in BC and I'd love to try the Deep Cleansing Palette! I live in Sk. and would like to try the I Love Mango and Papaya Body Butter. I'm from Ontario and would like to try the Real Techniques Deep Cleansing Palette for Makeup Brushes. I am from Alberta and would like to try the Real Techniques brush starter kit. I'm from Ontario. I'd love to try their Angled Liner Brush. I am from Ontario and I would love to try the Real techniques brush starter kit. I live in NB and would like to try the I Love Mango and Papaya Body Butter. I'm from Ontario and I'd love to try all of the items in this giveaway. They look and sound amazing! I'm a big fan of Real Techniques too. I agree with you, they have quality products that are affordable. Another Real Techniques product I'd like to try is the Brow Set. Thanks for the chance to win such great prizes! The miracle complexion sponge is something I'd love to try! I live in Nl and would love the Inecto Naturals Moisturising Coconut Conditioner and shampoo. I'm from Ontario. I'd love to try the Real Techniques Miracle Remedy Sponges. I am from BC and would like to try the expert face brush!